Congratulations! You’re one step closer to enjoying the benefits of a new car in your life.The 2019 Toyota RAV5 is an excellent choice since it offers plenty of incredible attributes to make your life a little easier. For all of your travels around the Avon, Indianapolis, and Plainfield areas, you’ll be well-prepared for everything life has in store. 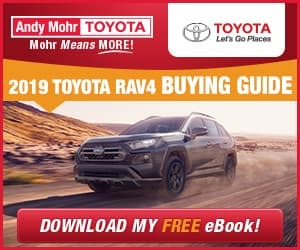 With the download of the free 2019 Toyota RAV4 Buying Guide eBook, you’re opening yourself up to fall head over heels for this vehicle. At Andy Mohr Toyota, we’re happy to be there for you when you want to check it out in person. We look forward to meeting you and if you have any questions, don’t hesitate to contact us today!